In the groundbreaking book Priceless, John C. Goodman reveals how healthcare is a complex system that cannot be managed from the top down. True reform requires liberating doctors and patients by allowing them to interact in innovative ways to help meet unique individual medical needs. The most important problems that plague American healthcare arise because we are trapped. Virtually all of uspatients, doctors, caregivers, employers, employees, etc.are locked into a system fraught with perverse incentives that raise the cost of healthcare, reduce its quality, and make care less accessible than it should be. Unfortunately, conventional thinking about how to fix those problems is marred by two false beliefs. The first is the idea that to make healthcare accessible it must be free at the point of delivery. The second is the idea that to make health insurance fair, premiums should not reflect real risks. Both ideas are the reason no one ever faces a real price for anything in the medical marketplace. Goodman demonstrates how these and other false beliefs have eliminated normal market forces from American healthcare, making it almost impossible to solve problems the way they are solved in other markets. Relying on a common-sense understanding of how markets work, Goodman offers an unconventional diagnosis that allows him to think outside the box and propose dozens of bold reforms that would liberate patients and caregivers from the trap of a third-party payment system that stands in the way of affordable, high-quality healthcare. 5 Why Do We Spend So Much on Healthcare? 6 Why Is There a Problem with Quality? 7 Why Is There a Problem with Access to Care? 8 Why Can't You Buy Real Health Insurance? The problems in American healthcare are likely to get worsemuch worsebefore politicians get around to making them better. With the advent of the Patient Protection and Affordable Care Act (ACA), perverse incentives will be set in place nationwide. Tens of thousands of employees will leave their employer plans and enter a no-mans land where the healthy will be desirable and the sick will be vulnerable. Those with serious health problems will find that they no longer have an employer who acts as a protector and defender. Their problems will be made worse by inexorable government pressure on the health plans to keep premiums from rising, so as to contain the expense of the taxpayer-funded premium subsidies. The ACA will not control costs. The Affordable Care Act is relying on dozens of pilot programs and demonstration projects to find better ways of delivering care. The results have been disappointing. Further, we will still be left with a system in which no oneno patient, doctor, employer, insurer or government officialwill be choosing between healthcare and other uses of money. And if no one is making those choices, healthcare spending will keep rising in the future with all the relentless persistence it has shown in the past. The ACA may reduce access to care for our most vulnerable populations. The 32 million newly insured will try to double their consumption of healthcare and middle- and upper-middle-income families will have more generous coverage than they have now, but there will be no increase in supply. As the rationing problems escalate, those with private coverage will surely outbid people paying Medicaid rates for doctor services and hospital beds. What would a better approach to American healthcare reform look like? A large portion of our healthcare dollars would be placed in Health Savings Accounts that we individually own and control. Patients would pay for most primary care, most chronic care, most discretionary care and extra out-of-network costs from these accounts. Doctors would advise patients on how to manage their health dollars as well as their care. They would be free to act as agents of their patients rather than of third-party payers. Insurance companies would specialize in the business of insurancethat is, pricing and managing riskand leave the management of healthcare to doctors and patients. Employers would be free to buy individually owned insurance for their employees. They would offer a monetary contribution to be applied to the health-insurance premiums of each employee, each pay period. Most would have no more involvement in the employees health plans than they have in their employees 401(k) portfolio. Patients with chronic conditions would be empowered to manage their own care, achieving results as good or better than under traditional care. They would also manage the money that pays for that care. Individuals would be allowed to insure against pre-existing conditions, so they could switch health plans without financial penalty. Health plans would have incentives to compete for all potential enrollees, regardless of health condition. The American healthcare system is plagued with problems that arise because we are trapped. Virtually all of uspatients, doctors, nurses, hospital administrators, employers, and employeesare locked into a system fraught with perverse incentives that raise the cost of healthcare, reduce its quality, and make care less accessible than it should be. Unfortunately, conventional thinking about how to fix those problems is marred by two false beliefs. The first is the idea that to make health care accessible it must be free at the point of delivery. The second is the idea that to make health insurance fair, premiums should not reflect real risks. Both ideas are the reason no one ever faces a real price for anything in the medical marketplace. 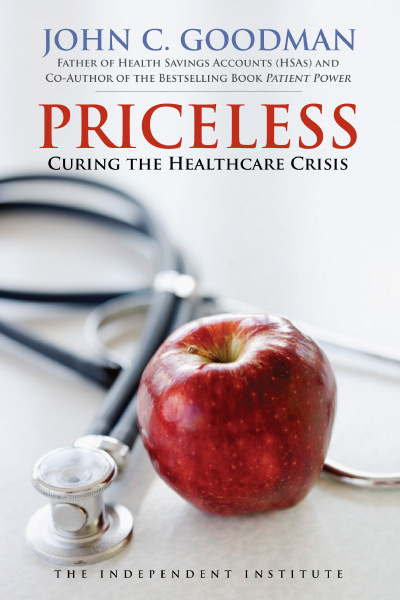 In Priceless: Curing the Healthcare Crisis, John C. Goodman demonstrates how these and other false beliefs eliminated normal market forces from American healthcare, making it almost impossible to solve problems the way they are solved in other markets. Relying on a common-sense understanding of how markets work, Goodman offers an unconventional diagnosis that allows him to think outside the box and propose dozens of bold reforms that would liberate patients and caregivers from the trap of a third-party payment system that stands in the way of affordable, high-quality healthcare. The healthcare system, according to Goodman, is a complex system. Its gargantuan size and countless subtle intricacies make it impossible for anyone to understand how it works in every detail. Like the economy as a whole, our healthcare system is far too complex to manage from above. But unlike a free market, American healthcare lacks a genuine price system, the mechanism that coordinates the actions of buyers and sellers in other markets. Instead, due to decades of government intervention, American healthcare is dominated by unwieldy third-party bureaucracies (insurance companies, employers, and the government) and by arbitrary payment formulas that have none of the helpful properties of market prices. Because normal market forces have been systematically suppressed, everyone in the healthcare system faces perverse incentives that make our problems worse. Since healthcare is largely free at the point of delivery, patients are encouraged to over-consume it. Doctors are in danger of becoming agents of third-party payers, rather than agents of their patients. They are increasingly encouraged to practice cookbook medicine, rather than to find creative ways to improve quality and reduce costs. Employers face perverse incentives to hire the healthy and avoid the unhealthy. Health insurance companies in the soon-to-be-created health insurance exchanges will face perverse incentives to over-provide care to the healthy and under-provide to the sick. As in other developed countries, perverse incentives in healthcare have created problems of cost, quality, access, and lack of real insurance, Goodman explains. Costs have escalated largely because the overwhelming bulk of payments to physicians and hospitals comes from third-party payers. For every dollar that patients spend at a doctors office, on average only ten cents comes out of their own pockets. This huge gap creates incentives to consume healthcare up to the point where the extra benefit is worth to patients only ten cents for every dollar paid on their behalf. In addition, healthcare providers have incentives not to search for ways to reduce prices, as producers in other markets do, but to exploit third-party payment formulas. Quality of care also suffers. By one estimate, adverse medical events kill as many as 187,000 patients each year, and non-lethal mistakes cause an estimated six million injuries per year. Quality varies considerably from provider to provider and is unrelated to what we spend. Why, then, dont the better hospitals compete more on quality, as producers in other markets do? Again, the incentive structure of the third-party system is to blame. When providers do not compete for patients based on price they don't compete on quality either. The problem of access to healthcare is widely misunderstood. For most people the obstacle isnt so much the price of care in terms of money, its the price in terms of time (the time it takes to schedule and wait for a medical appointment, the time needed to travel to and from it, and so on). This time price of care is more burdensome for people with less income than for those with high levels of income. Unfortunately, most healthcare programs designed to eliminate the money price of care cause the time price of care to be much higher than it would have been. Unlike casualty insurers, health insurers rarely tell potential customers that they need their product to help them in the event of a medical catastrophe. Instead they tend to advertise the services that healthy people want, such as wellness checkups, preventive care, and exercise facilities. Why? Because the health-insurance market is an artificial market in which the product offered is not real insurance. It more resembles prepayment for the consumption of healthcare. The Patient Protection and Affordable Care Acta.k.a. ObamaCareis a Rube Goldberg contraption, the result of a special-interest feeding frenzy. Its individual mandates will force us to buy something whose cost is rising faster than our incomes and will eventually crowd out every other form of consumption. Its bizarre system of employer mandates (including a $6-an-hour health minimum wage) and away-from-work subsidies will eventually force a complete restructuring of American industry. It also creates perverse incentives. Its health insurance exchanges, for example, give insurers incentives to over-provide to healthy enrollees and under-provide to unhealthy ones. The ACA will leave our social-safety net in tatters as the demand for medical services outstrips the supply. It will create severe problems of access to care for the elderly and the disabled as Medicare payments are cut. By 2020, Medicare nationwide will pay doctors and hospitals less than what Medicaid pays, and by the time today's college students reach retirement, Medicare will be one-third gone. Which changes are needed most to turn an unworkable health reform effort into genuine health reform? Goodman offers several, including replacement of the bizarre system of subsidies and penalties with a uniform, refundable tax credit (say, $2,500 for every adult and $8,000 for a family of four) to fund the core insurance we want everyone to have. Goodman also argues that the insurance mandate should be dropped. If people choose to remain uninsured, their unclaimed tax credit could go to a local safety-net institution and used when the uninsured cannot pay their medical bills. Goodman also offers a host of ideas that, if adopted, would enable doctors and patients to use their intelligence and creativity to make the changes needed to create access to low-cost, high-quality healthcare. Doctors, for example, would be free to repackage and re-price their services in patient-pleasing ways, rather than conform to the dictates of third-party-payer bureaucracies. The widespread adoption of Health Savings Accounts would cut costs by 30 percent or more. Individuals would be responsible for their own primary care, most diagnostic tests, and inexpensive outpatient care. Insurers would pay for inpatient care by using a value-based purchasing approach, under which the insurer pays only the amount that will cover low-cost, high-quality care and patients pay the full extra cost if they choose to patronize other providers. Medicare could be reformed in several ways. The perverse incentives for doctors to provide care that is too costly, too risky, and inappropriate could be eliminated. We could also reduce the misallocation of medical skills that arises from Medicare overpaying for some skills and underpaying for others. Doctors should be able to get paid in different ways so long as the cost to the taxpayer falls and the quality of care increases. Medicaid perpetuates a two-tier healthcare systeman inferior one for the poor and a better one for everyone else. Ideally, Medicaid would be abolished and the savings would go to subsidize private insurance for low-income families. If that is too radical for the body politic, there are other alternatives. For example, Medicaid could get out of the business of dictating prices and instead oversee a Health Stamp program, fashioned after the Food Stamp program. Enrollees would be free to add their own money to the value of the stamps and purchase services in the larger medical marketplace. Low-income families on Medicaid could then compete on a level playing field with other patients for healthcare resources. Patient safety could be improved. One way that Goodman discusses is to create an alternative to malpractice litigation: allow patients, doctors and hospitals to enter into voluntary, no-fault contracts. In return for forgoing their common-law rights to litigate, patients would be assured that if they experience an adverse outcome for a reason other than the medical condition for which they seek care (whether or not malpractice is involved), the provider institution will write them a check, without lawyers, without depositions, without judges and juriesno questions asked. After discussing these and many other promising reforms, Priceless concludes with a discussion of two principles that must be applied in order to significantly improve the markets for healthcare and health insurance. First, prices must be allowed to reflect marginal social costs, where possible through the operation of market competition. Second, health insurance premiums should be able to reflect real risks in a market in which people would be able to insure against the onset of pre-existing conditions. The adoption of these principles would help enormously to bring about higher quality healthcare at an affordable cost. Peter R. Orszag, former Director, Congressional Budget Office; Vice Chairman, Global Banking, Citigroup, Inc.
Angela F. Braly, former Chairman and Chief Executive Officer, WellPoint, Inc.
Whether Mitt Romney wins the presidency or President Obama is re-elected, they and Congress would be well advised to read and digest John Goodmans book Priceless. Whoever is president will soon find himself facing unintended, but often predictable, consequences of the new health care law and also of previous laws. Whether the issue is Medicare or Medicaid, health savings accounts, the tax treatment of health insurance, ths costs and effects of preventive health care, the wastefulness of single payer health care systems, or the perverse effects of Obamacare, Goodman brings an encyclopedic knowledge to the issue. A reader who is skeptical of his claims can check one of the literally hundreds of studies and government documents that he footnotes. Goodman alternates between being an idealist who wants to get government out of health care, and being a policy analyst who takes certain goals as givensuch as having government give health care aid to low-income peopleand considers more efficient ways of achieving them. So, whether you want to make a scase for complete separation of health care and state (as I do), of youre a legislator who wants to make incremental improvements away from current dysfunctional health care policy, much in this book will inform and help you." "John C. Goodman's Priceless tells the story of a health-care system largely controlled and undermined by the federal government, which is now poised to take over the rest of that system and finish the job of ruining it. The means of this death blow, of course, will be the Patient Protection and Affordable Care Act, or Obamacareunless Republicans succeed in repealing it shortly after President Obama leaves office in 2017." "Many thanks for Priceless: Curing the Healthcare Crisis I am pleased to have it and look forward to reading it. Your straightforward, commonsense approach is refreshing, and the book's publication is well-timed. There is much to be done in providing affordable healthcare for Americans."